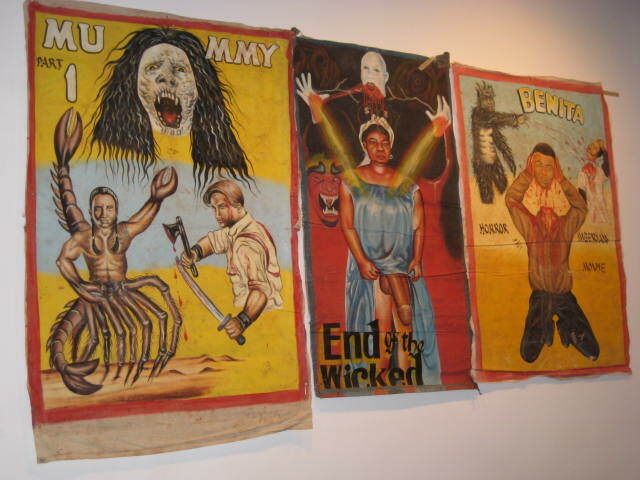 Three Holyoke exhibition spaces: The Storefront Project Room at 80 Race Street; The Parsons Hall Project Space at 360 Dwight Street; and the Taber Art Gallery at Holyoke Community College are pleased to present over 100 hand painted Ghanaian movie posters from the collection of Michelle Gilbert. Starting in the 1980s, entrepreneurial operators traveled with video recorders and TV sets to rural Ghanaian villages. Creating makeshift movie houses, often in tents or open air cinemas, they showed violent and often bloodthirsty films on televisions run with generators. 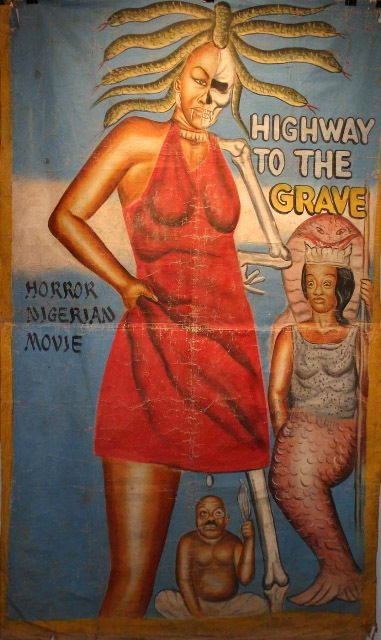 Though many were films from America and Asia, most of the posters seen in this exhibition were created to promote the Nigerian made films. Hand painted on the backs of flour sacks by local Ghanaian artists they combine elements of traditional African art and modernity. 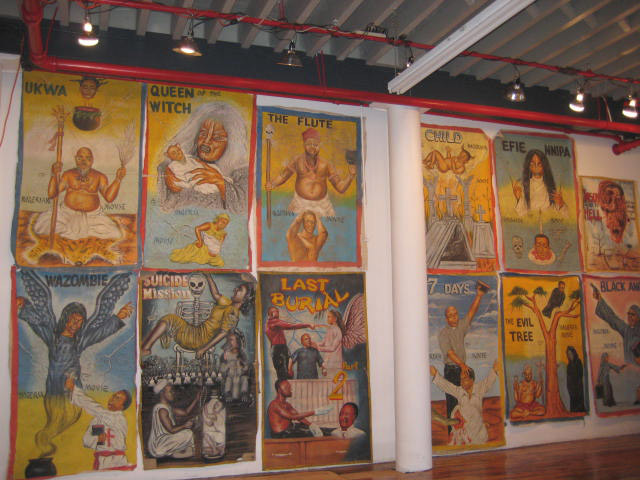 The artists, in their own styles, often painted these posters before seeing the film themselves. Sometimes they referenced images from the accompanying tape jackets to create these bold and often gruesome advertisements. 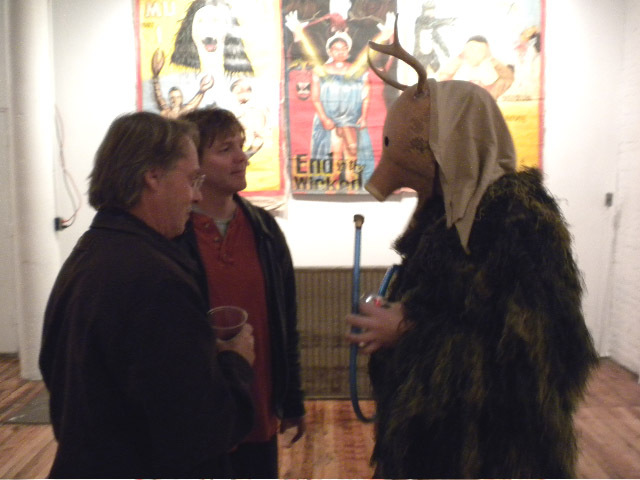 Many of the images are purely from the artists imagination and may not appear in the film at all. The more shocking the poster, the more likely a show would sell seats. The canvases are tattered and faded from their use to promote the movie as it traveled from village to village. Some of the flour sacking labels bleed through to the front, and some have stitching or patches of odd cloth. This intriguing twist on form and function only adds to the beauty of this dying art.Today mass- produced paper posters are replacing the hand-painted posters in Ghana. 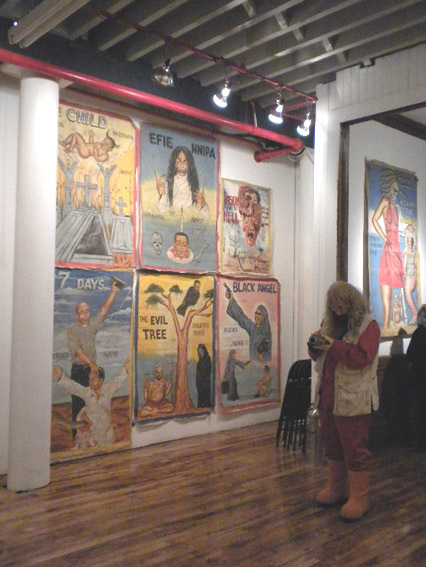 This exhibition offers a peek into that disappearing art form as well as an opportunity to purchase the work. Each poster will be available for sale for $350.00. 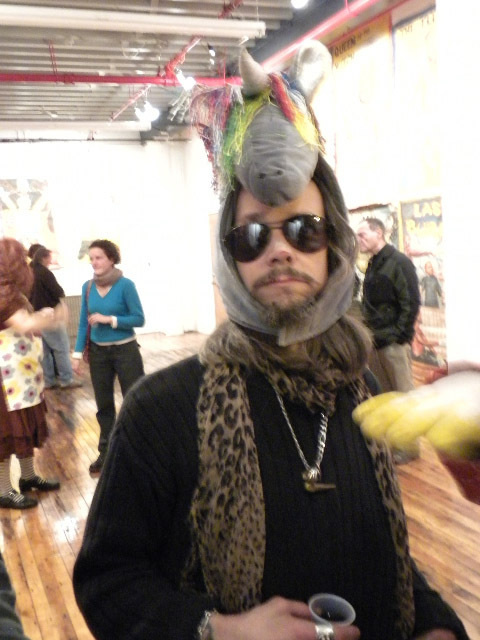 Michelle Gilbert teaches anthropology and art history at Sarah Lawrence College, Bronxville, NY. Since 1976 she has done fieldwork in an Akan kingdom of southern Ghana on art, religion and politics on which she has written many articles.